15 Stainless Steel Integrated Drink Holders: Located at all seat locations for easy access for everyone on board. 3 Position No Wake Mode: Three different RPM settings allowing the driver to easily increase or decrease their no wake speed to find the optimum setting. Adjustable Tilt Steering Wheel: Allows the operator to adjust the angle of the steering wheel for added comfort. Ample Seating for 11: J-shaped seating with dual captain''s chairs provides excellent comfort and versatility. Dinette Table: With all new side mounts at cockpit and stern. High-quality Trailer: Every SX240 High Output comes complete with a custom painted trailer, spare tire and mount with swing-away tongue for easy storage. Innovative Swim Platform: This stern with Hydro-Turf® mats and upholstered backrest cushions can be transformed into a private patio on the water. New for xxxx, the swim platform sits just inches above the water line, making easier than ever to get in and out of the water. Marine Grade Carpet Kit: High-grade, removable carpet throughout the cockpit adds to the SX240 High Output comfort and great looks. Multiple Storage Compartments: Ten storage compartments include an enclosed head compartment (boat is not equipped with portable toilet), anchor storage compartment, storage under each seat and compartments under the starboard console. The SX240 High Output is also equipped with a full-size ski locker that accommodates skis or wakeboards. Stern storage is perfect for wet items, like ropes and wetsuits. Premium JBL® stereo system with MP3 auxiliary input. The SX240 High Output utilizes a deep-V, multi-chine hull with 20-degree dead rise. The hull and deck are constructed of multiple layers of fiberglass with sandwich core construction reinforcements. The fiberglass liner, which is separately constructed, represents a revolution in boat design, combining the floor, stringer, and engine mounting system. It is constructed from a custom blended polyester resin with engineered fiberglass laminates and 3/8" xxxx-T6 aluminum plate for the engine mounts. The liner is bonded into the hull with polyurethane adhesive and then injected with foam to provide maximum floatation as well as longitudinal and lateral structural rigidity. The deck is then fastened to the hull with both mechanical fasteners and polyurethane adhesive giving this revolutionary semi-monocoque fiberglass structure unsurpassed strength and rigidity. Jet Pump Clean-out Plugs with Push Button: Allows for direct access to the inlet duct cavity to easily clear any debris from the pumps from inside the boat. The SX240 High Output twin 155mm hyper-flow jet pump propulsion system with three-blade stainless steel impeller: Designed to maximize water flow for high performance. The twin pump configuration provides excellent hook-up and smooth acceleration. SAWS (Scavenger Assist Wet Sump): Equipped with a high-performance, compact gas-liquid separator, this engine uses Yamaha''s unique ultra compact lubrication system and the oil pan structure. 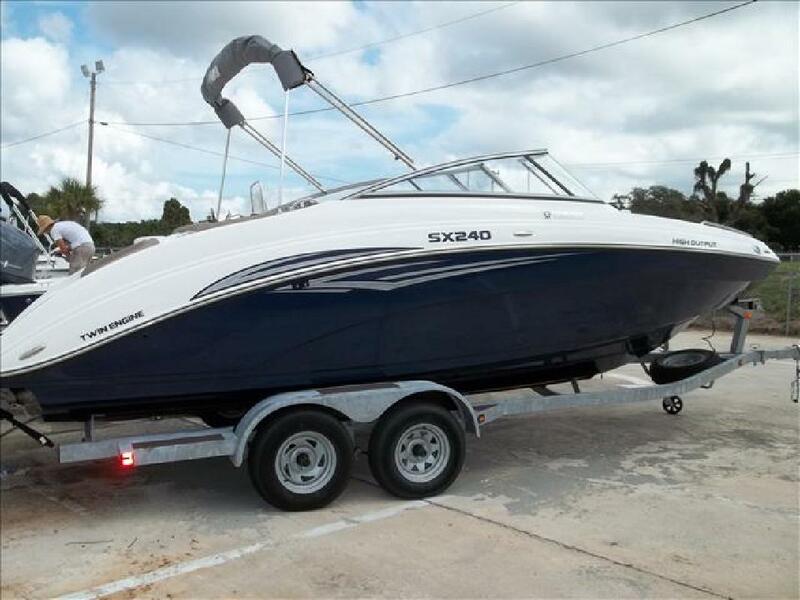 The SX240 High Output is powered by twin 1.8L Yamaha High Output engines. These xxxxcc four cylinder, four-stroke Yamaha marine engines deliver excellent power in a compact package.